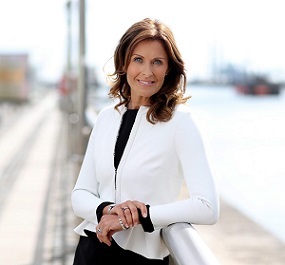 Alison Comyn is an IFTA-winning journalist and broadcaster, recently known as news anchor of Ireland Live and the face of UTV Ireland. A Drogheda native, she has presented numerous current affairs and entertainment programmes in the UK and Ireland with RTÉ, BBC, Sky News Ireland and Channel 4, as well as covering for Joe Duffy on numerous occasions on Liveline on RTE Radio 1. Alison has also been a reporter with Sky News Ireland, a regular contributor to ‘Four Live’ and ‘Today’ on RTE 1, and was shortlisted for Regional Journalist of the Year at the NNI Awards. With over 25 years in the media business, she also runs Alison Comyn Communications, training professionals in communications, media and presentation skills, and personal impact & branding. She regularly appears as a guest speaker, with topics including Making an Impact, Communicating with Confidence & Personal Branding. Popular with women’s affairs and gender equality panels, with Alison Comyn as your presenter, chair or moderator, you get energy and enthusiasm injected into every part of the connecting elements of you event or conference, while continuing to engage attendees. Alison draws on decades of broadcasting experience, and is equally at home chairing a conference, moderating a lively debate or hosting a glittering ceremony. Her warm, natural style can be adapted to any event, and she can switch between presenting and interviewing roles with ease, ensuring an event with pace and energy, which always finishes on time! To book Alison Comyn for your conference or event or to talk to us about your event requirements, please submit the enquiry form or call us on 087 718 1360.